Plumbing snakes come in many different shapes, sizes and lengths. 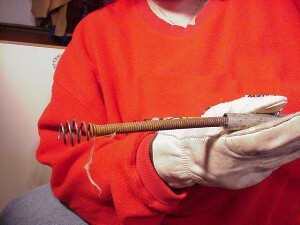 Most snakes consist of a flexible wire shaft with some sort of "auger" head on the end. Also included is a method to turn the snake while it is winding its way through the pipe. Turning the snake as it goes serves two purposes: the first is to help it get around bends and the second is to help it securely grab whatever it is that is blocking the pipe. For most purposes, a 15'-20' snake that is around 3/8" in diameter will do nicely. Note: It IS possible for the snake to get stuck in the drain! Open up the pipe that you need to unclog. If you are working on a clogged drain, the best place to start is normally under the sink. Take the snake and extend a bit of slack in front of the turning handle. Place the snake into the pipe and begin working it down the pipe. Note that when you hit a bend, you will likely have to turn (spin) the snake to help it get past the bend. When the handle gets up to the pipe opening, loosen the set screw and slide the handle back down the snake. Tighten the set screw and keep working the snake down into the pipe. Sometimes it is obvious when you hit the clog, turning the snake will become more difficult or impossible. At this point, pull the snake back and see what is there. Remember, do not get too tough with the snake. It is possible to get it stuck in the pipe, requiring the services of a professional to get it out!